While some view California's rapidly escalating housing costs as an impediment, one company from America's Natural State is taking a contrarian view and sees a golden opportunity in the Golden State. Mountain Home, Arkansas-based Affordable Family Development (AFD) has announced its intent to pursue a manufactured housing site on a vacant parcel in Elk Grove. The parcel AFD purchased for their development is the long-vacant 18-acre site located on the northeast corner of Sheldon and Power Inn roads. According to AFD founder and president Ed Tom Bell, Elk Grove's recently passed general plan update caught their attention while attending the annual South by Southwest Conference in Austin, Texas. Bell said the city's flexibility in zoning matters makes it an attractive community to establish a manufactured housing park. "Our contact Bear from Retail Strategies in Birmingham, Alabama told us all about Elk Grove at the conference, and how easy it was dealing with the people at city hall," Bell said. "Even though they adopted an update to their general plan, we've come to understand the city council is open to amending the plan as they see fit, and the city will permit us to place language for overriding considerations." Housing affordability has been an Achilles heel not only for California but it has placed burdens on longtime residents of Elk Grove who are hoping to establish households in the community they have long called home. Many new families are being priced out of the housing market by so-called equity refugees from the Bay Area who are artificially escalating housing prices in Elk Grove and other Central Valley bedroom communities. Bell avoids using the term mobile home park to describe AFD's housing communities noting they are well maintained and a phenomenal way for young families to build equity. AFD owns and operates 14 parks in Arkansas and manages another seven in West Virginia (posted below is our exclusive interview with Bell recorded early this morning). "I understand mobile home parks have a less than positive connotation, but our parks are filled with mostly double-wides and they must be less than 13 years old when they are placed in our communities," Bell said. "We are sure when the city council sees the quality of our parks they will be singing high-praises that we are helping them with the housing shortage." Typically, manufactured home parks have about 10 units per acre so the site could accommodate about 186 single-family dwellings. AFD has named their development Sheldon Chateau de Déverser which will include a clubhouse and swimming pool in the center of the park. Bell noted that the site on Sheldon Road is perfect for young families given that two elementary, a middle school and a high school, as well as shopping and mass transit stops, are all within walking distance. Additionally, the park will be an example of fair housing and suburban land planning given that it is located directly across the street from Elk Grove's most exclusive private gated neighborhood, Shortline Lake. "We have proven that whenever we place one of our communities near exclusive neighborhoods, we enhance the value of those places," Bell noted. "Undoubtedly the residents behind the gates of Shortline Lake community will be happy to open their arms to their new neighbors." Although AFD has targeted the Sheldon Road site, their first choice was to purchase the Elk Grove Shopping Center on Elk Grove-Florin Road and demolish it for their entrée into California. In the end, Bell took note of the furor raised by California Northstate University's plan to demolish the Stonelake Landing shopping center in the master-planned Stonelake community for their proposed $750 million hospital. "Our approach has always been based on being neighborly, and doing what is right for the communities where we operate," he said. "We are not taking Dr. Cheung and California Northstate's approach which seems to be 'if the only tool you have is a hammer, then every problem is a nail.' We'll take a friendlier Southern hospitality-based approach." Along with providing affordable housing options, AFD has a long history of community involvement. In its home town, it has sponsored the Redneck Games and hopes to establish a similar event in the city's rural Sheldon community or possibly nearby Wilton (see video below). As for operating in California, Bell said he is not concerned about the economic challenges compared to Arkansas or West Virginia. To the contrary, Bell noted there are certain advantages California offers. "Unlike southern states, we don't have to worry about tornadoes in California," Bell stated. "You'll never have to hear the joke about 'what does an Arkansas divorce, and a tornado have in common? You know someone is losing the double-wide trailer.' That won't happen in Elk Grove." 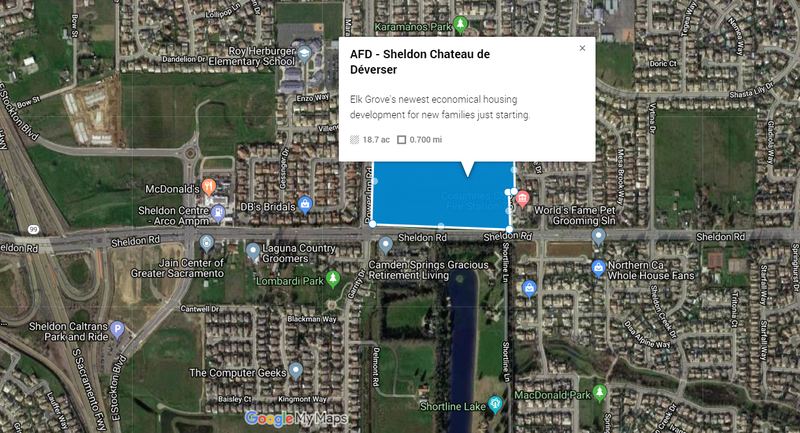 AFH hopes to have permits in place so they can break ground on Sheldon Chateau de Déverser by April 1, 2020. Ed Tom Bell! Gotta love it! I moved to Elk Grove because I thought is was a good place to raise my family. Now I'm learning the council is for sale and they'll do whatever developers want for a price. That's totally unacceptable! This town is already full of fast food joints and discount shopping stores. We don't need these trailer parks too. I understand that Councilman Detrick lives across the street is a gated community and fought to keep Walmart from building on this proposed site. Looks like those Arkansas boys are preparing a little redneck payback. If what I hear is true, those other copuncil members will vote to approve the trailer park if the money is right despite Detrick's wishes. Your comment makes me ill. There are many people who around 2013 or so lived in a beautiful home in Elk Grove, but had to sell it because their business went under. You don't know what some people who once were successful had to deal with. Purchasing a mobile home was a viable option. Many are quite lovely, and I'm sure the new ones even better. Build em, and people will come. EGN needs to back off! This article takes unfair swipes at the city and Shortline Lake residents. Please cancel my subscription to EGN, effective immediately. I first subscribed to EGN through the Publisher's Clearinghouse Sweepstakes and besides not wining any money, I now have to endure the endless cheap shots aimed at our city leaders. Please take me off your list. I am sure EGCAPP (Elk Grove Coalition Advocating Proper Planning) would bless this project and advocate for it. And yes Steve L, got to love Ed Tom Bell! Lots of country smarts in his assessment of Elk Grove. This is very funny this is a good one!